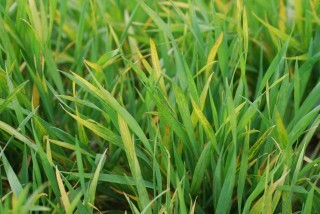 Wheat streak mosaic virus is one of the most damaging and costly diseases wheat producers encounter, but plant pathologists have recently uncovered a way for the wheat plant to defend itself against this particular virus and others. Patent-pending technology has shown success in disease resistance to wheat streak mosaic virus and triticum mosaic virus, among others. Newswise — MANHATTAN, Kan. – Wheat diseases caused by a host of viruses that might include wheat streak mosaic, triticum mosaic, soil-borne mosaic and barley yellow dwarf could cost producers 5 to 10 percent or more in yield reductions per crop, but a major advance in developing broad disease-resistant wheat is on the horizon. The Kansas Wheat Commission has provided funding for this research. More information about K-State’s Department of Plant Pathology is available online (http://www.plantpath.ksu.edu). A video interview with Fellers and Trick can be found on the K-State Research and Extension YouTube page (http://youtu.be/mXiw78MpS0E).